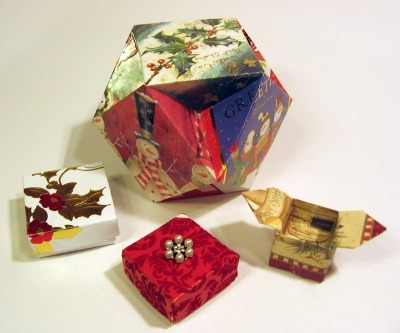 I turned my pile of holiday greeting cards into three origami boxes and an easy modular unit (links to folding instructions below). 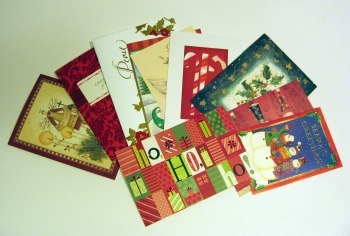 Sort through your cards looking for ones with borders, special textures, like flocking, and illustrations or photos that make them ideal for display in the modular unit (click for how-to). 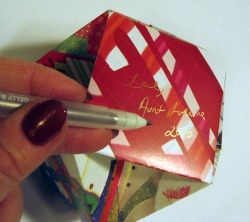 A metallic gel pen is an attractive way of noting the sender of each card. Cards with borders make cute candy dish boxes (click for how-to). The border runs all the way around the bottom of edge of the box. 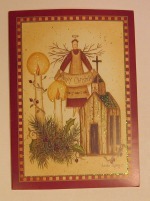 I chose beautiful embossed and flocked cards for masu boxes (click for how-to). An old pierced earring made an ideal button for the top of the red-flocked box. I shop for earrings at my local thrift store. I finished the insides with matching pieces. 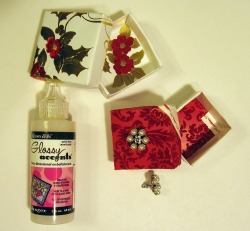 The Glossy Accents product adds even more shine and dimension to a flower on a box lid.